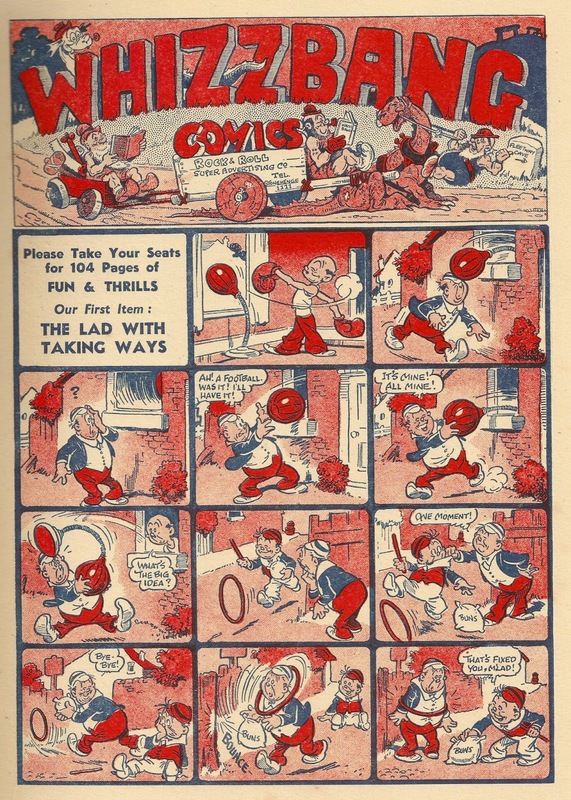 According to Denis Gifford's book 'The British Comic Catalogue 1874 - 1974', The World's Comic ended on 10th November 1908 and merged into Funny Cuts the following week. This was not the case however, for I have a copy of the comic from 28th November 1914 - over six years after Denis claims it folded. I can't say whether he corrected this information in his 1985 book 'The Complete Catalogue of British Comics' because I don't own a copy, but I think The World's Comic actually ended sometime in 1915. I believe this because the front cover character, Bounderby Bouncer (also known as Bounderby Bounce) appeared on the cover of The Big Budget from 1899-1900 and then Funny Cuts from 1915-1918. I suspect he was revived for The World's Comic when WWI broke out (he was the "war correspondent") and then moved over into Funny Cuts when the two comics incorporated. That would just be my guess - can anybody confirm any dates? 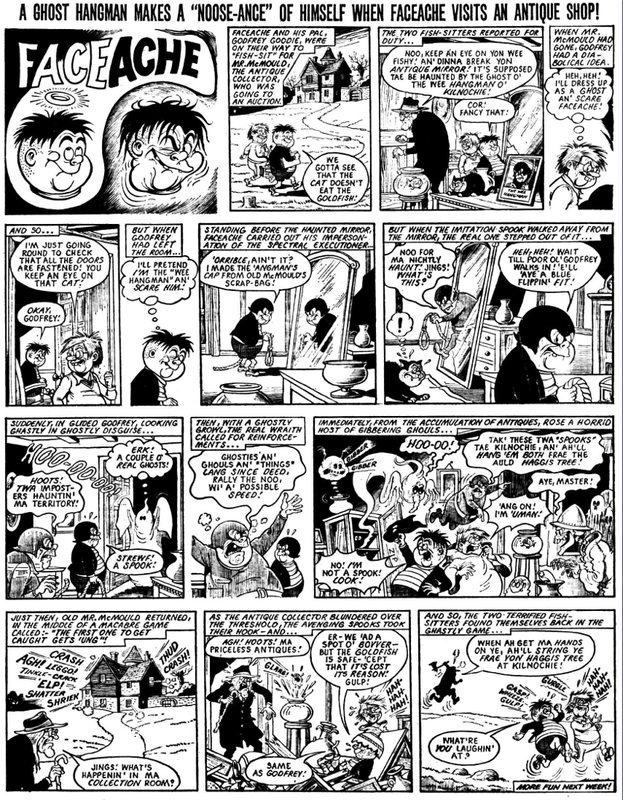 The cover strip becomes quite racist with the third panel when Bouncer says "I was wending my way home in Buckingham Pal - well, towards my home, when I suddenly heard strange sounds. At first I thought I was near a pig-stye, but, listening more attentively, I recognised the sounds as German. Concealing myself, I approached, and I recognised two German spies." Ooer - that really reflects the times, doesn't it. The First World War had of course begun some months earlier so there was a most unfriendly attitude towards the Germans at the time - there are a lot of strips I've read from the period in which poorly disguised German spies are carrying around a large sheets of paper with "Der Plans" written on them in big bold letters, only to be easily defeated by some typical British character. 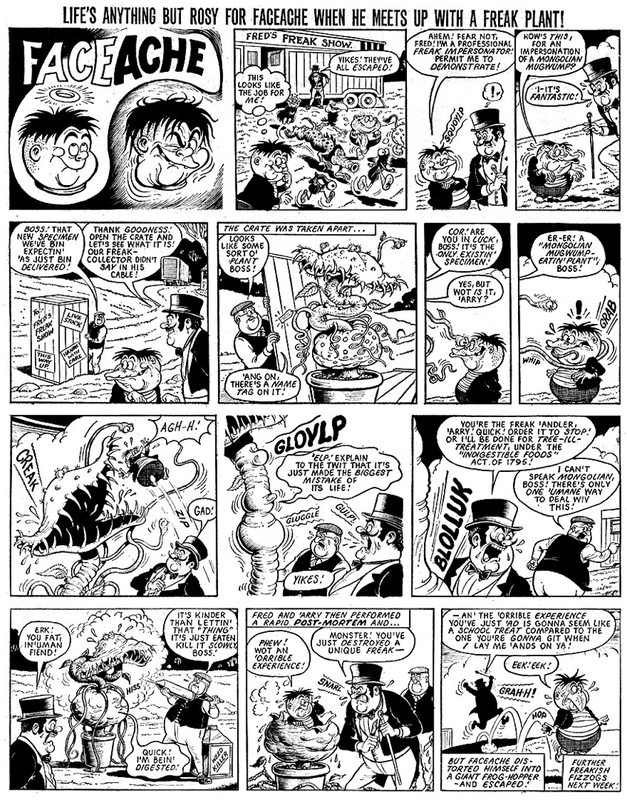 This strip is somewhat different as Bouncer comes out worst here but usually characters are honoured with a medal or slap-up feed. It might just be my imagination, but to me Bounderby looks a lot like Ally Sloper in a military uniform. Before we move on inside I thought I'd just quickly sum up the value of this comic. For 1D readers got an 8-page black and white comic that measured 11" x 14.5" and was printed on pink paper, but unusually 6 pages consisted of pictures and just two of text, instead of the familiar 50:50 ratio. The two pages of text are made up of one text story entitled The Mystery of The Grey House written by H. Philpott Wright (probably a pseudonym). There is also a jokes and letters page that consists of a mixture of text and pictures so I've counted it as a picture page. 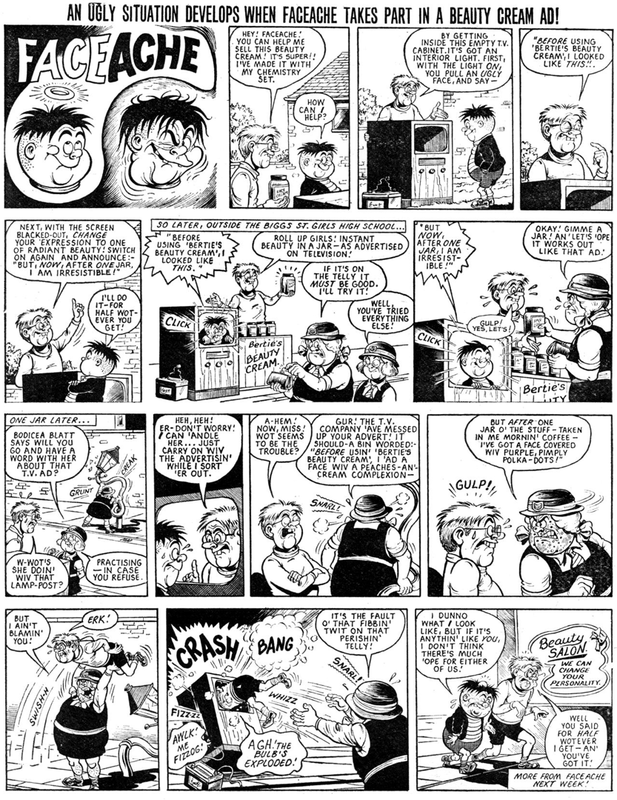 I'll skip these pages and concentrate on the comic strips for this post, and what better way to do so than by showing the entire centre spread, which includes five comic strips and two picture jokes (I've counted the baby strip at the bottom as one picture). Turn over and opposite Smiles from Everywhere (the jokes page) is an untitled strip about the Cheerychub family. And finally the back page, which is fairly typical of comics of the time, features a collection of short comic strips and jokes. 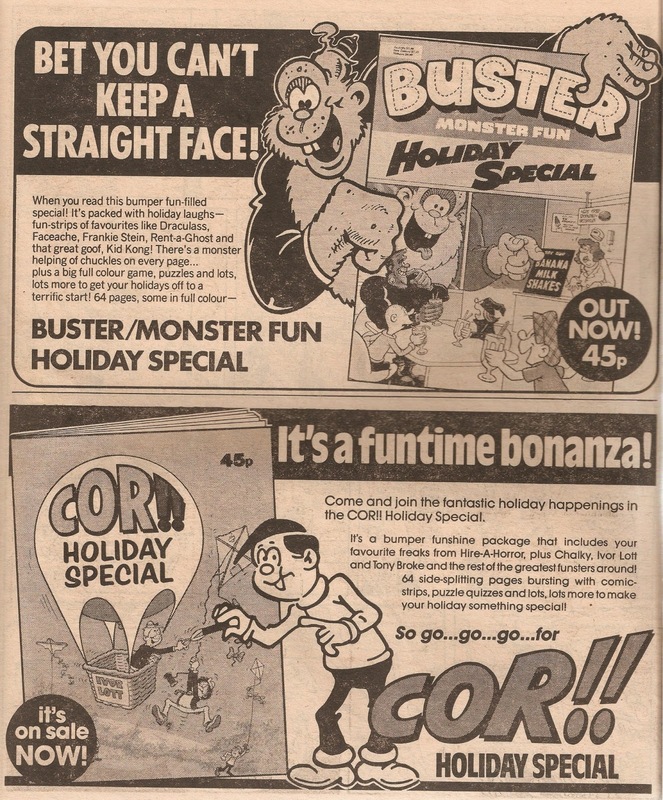 There's also an advert for Picture Fun in the bottom left. That sums up this post on The World's Comic. If anybody can clear up the mystery about the end date of it please let me know in the comments section. 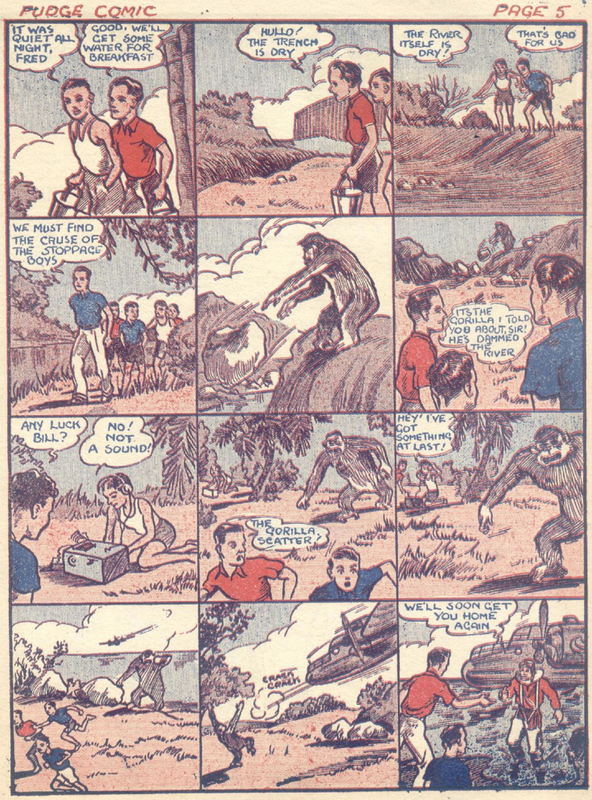 Whisk yourself back in time and imagine being a young boy or girl waking up on the Christmas morning of 1942, slap-bang in the middle of the war, and being given a bright comic annual with the fantastic name of Whizzbang. 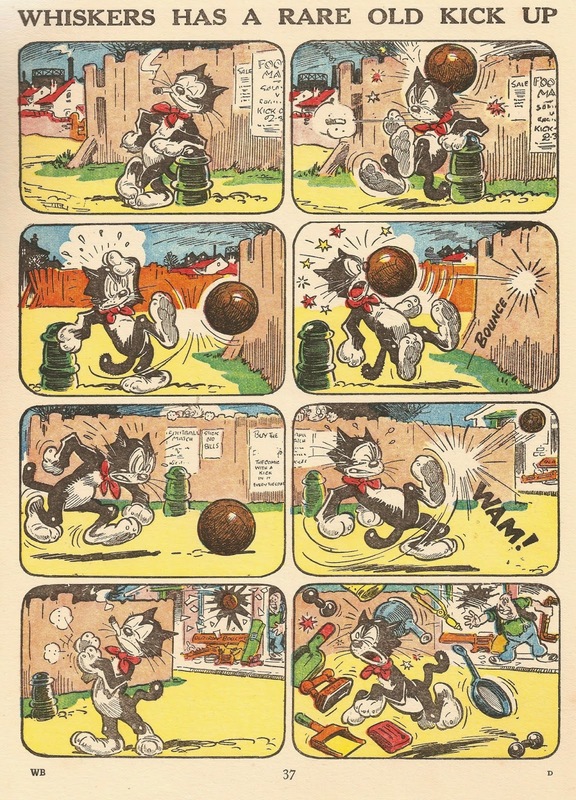 Yes, the first Whizzbang Comics annual came out in 1942 and is known as the 1943 annual. It was the first of two and both are now quite scarce as due to paper shortages and restrictions print runs were very low. It was published by Amalgamated Press and was not based on any existing comic. 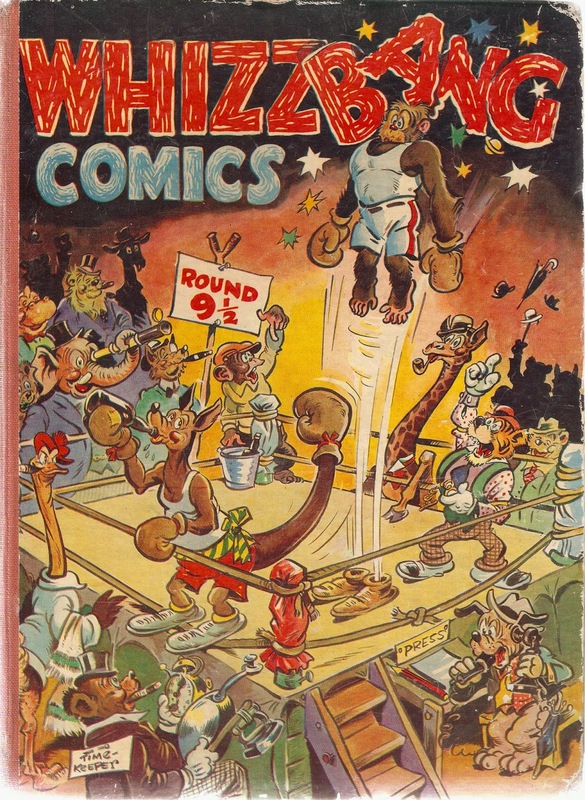 There was a one-shot comic called Whizzbang Comic published by Philmar in 1948 but it is unrelated - I wonder if it took inspiration for its name from this annual. 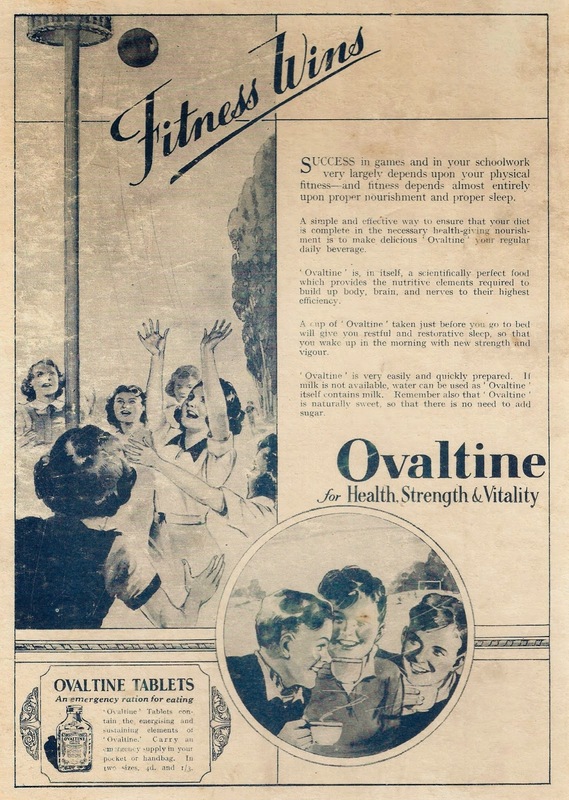 The front cover is illustrated by Roy Wilson and features something that would not be allowed nowadays - smoking. I can spot no less than 5 cigars and pipes. 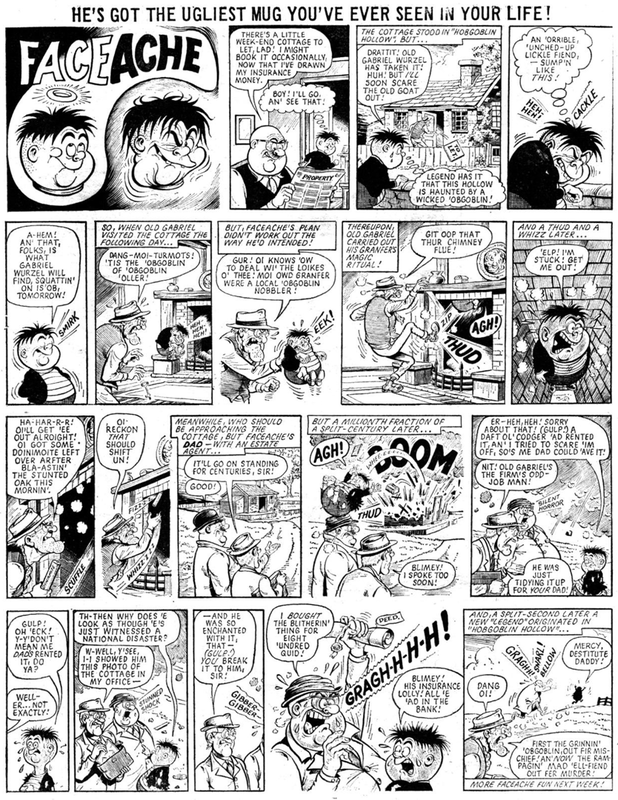 Roy illustrated a number of inside strips as well - I'm fairly certain this Whiskers page, also about smoking, is by him. As you would expect with an annual from this time there is a good mixture of comic strips and text. Of the 114 pages (including the covers) 6 are blank, 46 1/2 are comic strips/illustrations, 1 (the back cover) is an advert and the rest is text. I'm afraid I can't give the original price, as, unless my copy is missing the front page, it isn't mentioned. 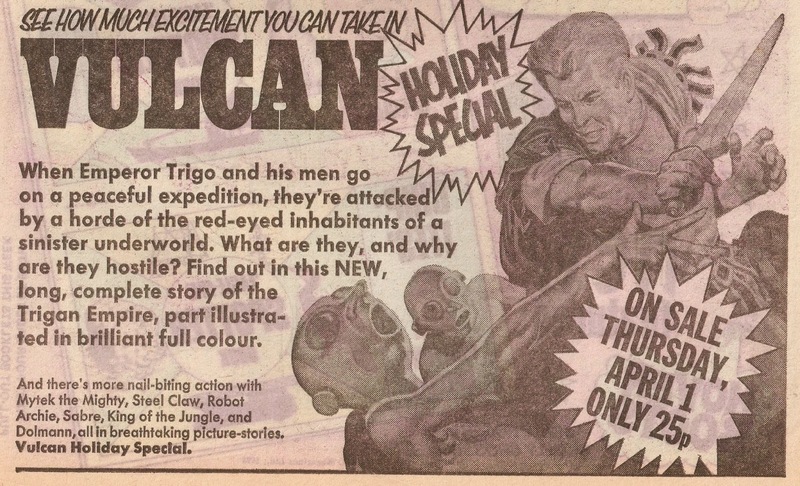 Here's the advert from the back cover. Let's head back to the start of the book, and take a look at the first comic strip. Roy Wilson illustrates The Lad With Taking Ways, underneath a nice header. 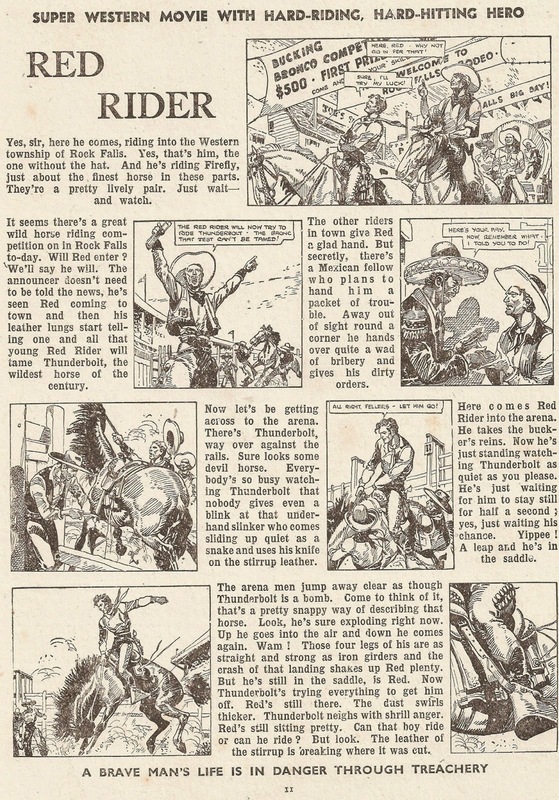 Throughout the book there can be found several adventure strips, the first entitled Red Rider. It's four pages in length but I'll only show the first page. I've no idea who the illustrator is; it's a shame the panels were printed so small - it's hard to see all the detail. The last pages I'll show come in the form of this two-page spread. 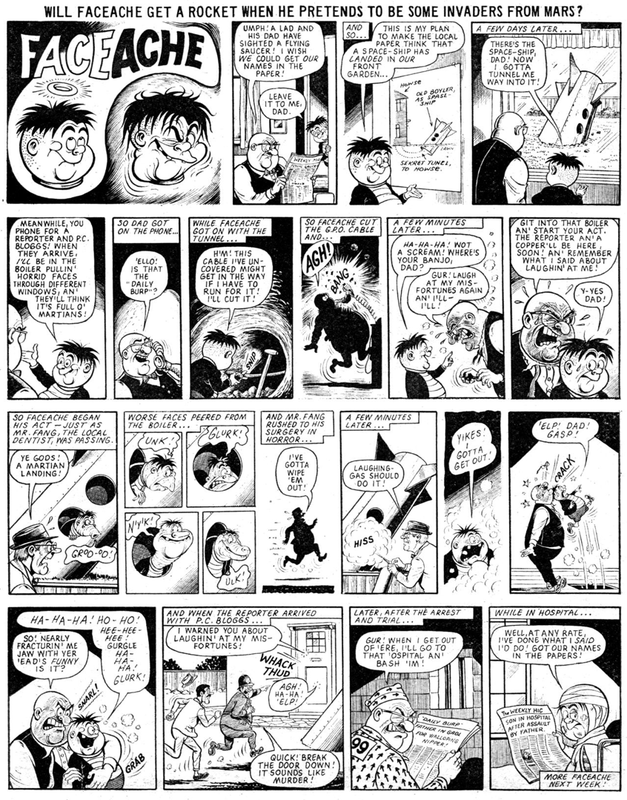 It features no less than three comic strips and a puzzle at the bottom. This was a generally enjoyable book. I'd recommend trying to find a copy but going by the price reached earlier this year on Compal Comics of £220 for both books it looks like you'd have to have deep pockets, unless you're lucky enough to stumble upon one in a second hand bookshop or somewhere similar. I missed out on the above comics on eBay this morning which I was a bit disappointed about but I came across a downloadable copy of The Fudge Comic over on Comic Book Plus, so I thought I may as well take a look at it. 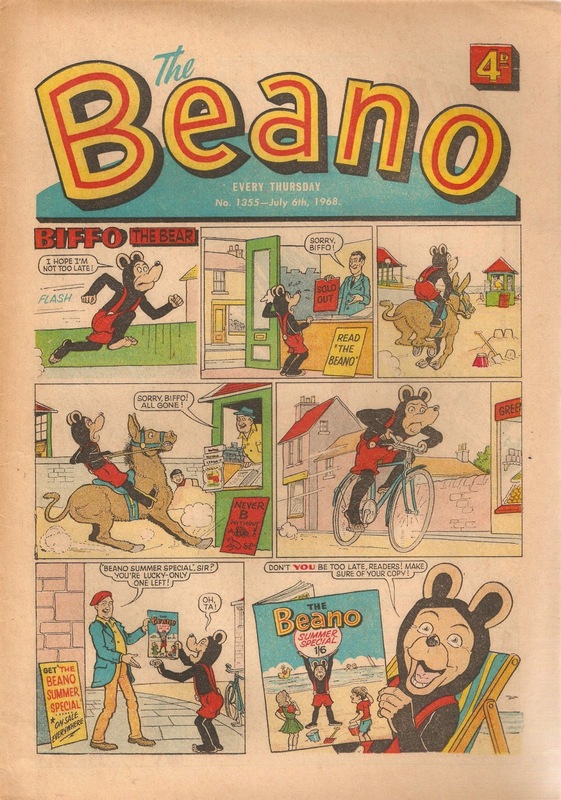 Both The Bang-On Comic and The Fudge Comic were one of the many one-shot wonders that appeared during and after World War Two as a direct result of both the paper and publishing restrictions. Fudge & Co. Ltd published both of them and the eBay seller believes them to be from the 1950's, but this is unlikely as restrictions were lifted in early 1950. I would date them at around 1947 or 1948. For 2D they were 1D cheaper than most of the one-shots that I've seen and still had the same number of pages - eight, with blue and red ink on the covers and centre spread and just blue ink everywhere else. David Williams drew everything in both comics and they were companion papers so they were both on sale at the same time. Sadly I can't show any more from The Bang-On Comic other than the front cover above (I'd liked to have compared the two), so let's concentrate on The Fudge Comic from now on. You should be able to read the cover story from the front cover above but if not here's the scan from the download. Sadly the colours are offset on this copy making it a bit blurry but it's still readable. 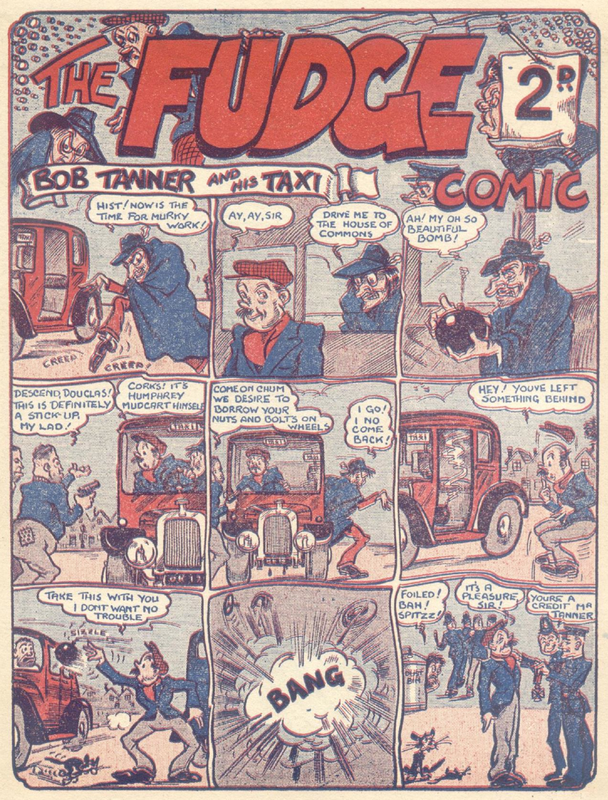 The cover strip is Bob Tanner and his Taxi. Moving inside and we see that half of the eight pages are given to text features. 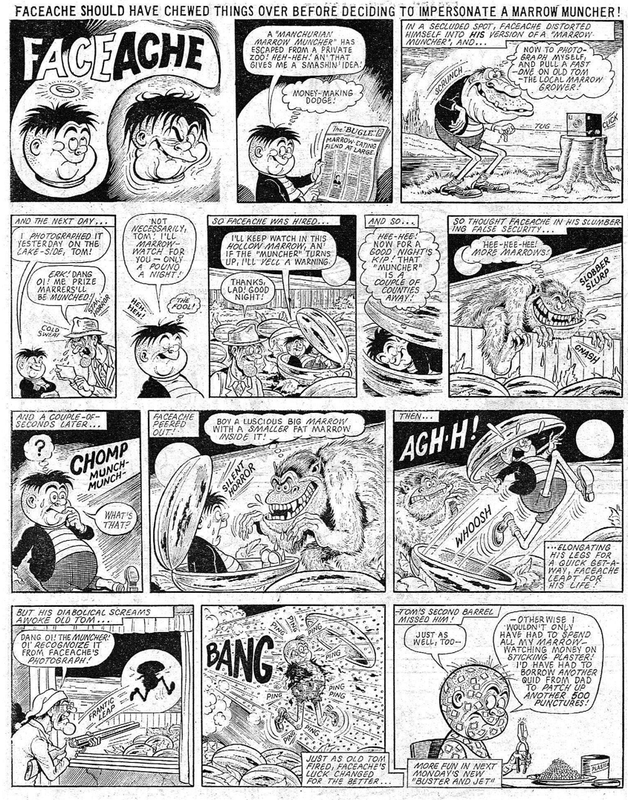 I'll be sticking to the comic strips here but for sake of completion those text stories were 'When the Redskins Ruled' (2 pages, credited to Arthur Whyat), 'Muggsy's Wishbone' (1 and 1/2 pages, credited to Allen Walters) and 'Strange But True' (1/2 page, credited to Brian Gerard). These three stories are credited to three different authors but I suspect they were really all the same person under various pseudonyms to make the comic look more professionally made. 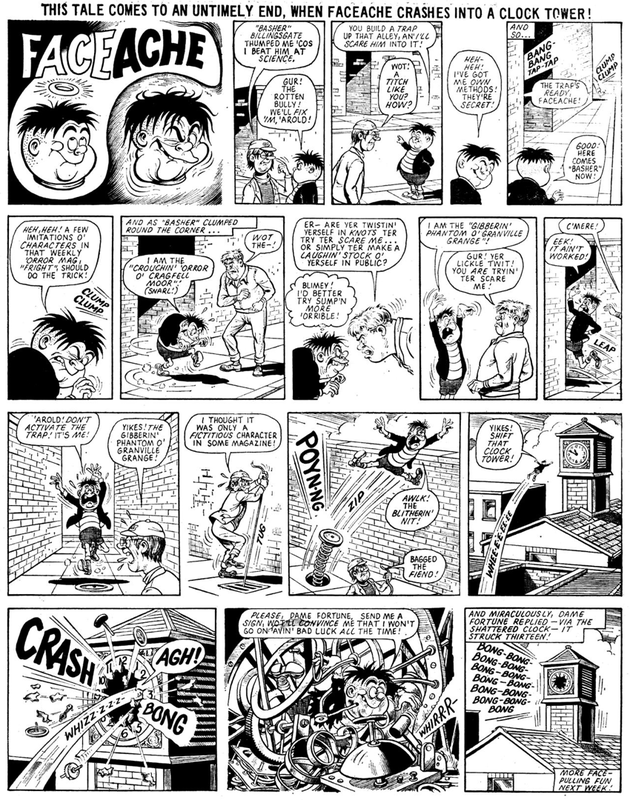 The first comic strip inside is The Shipwrecked School, which reminded me of Mike Lacey's Shipwreck School many years later from Wow in 1982-3. This story is, quite frankly, awful - it isn't made clear that the ship is sinking and why it did sink, and it seems too cramped for just two pages. 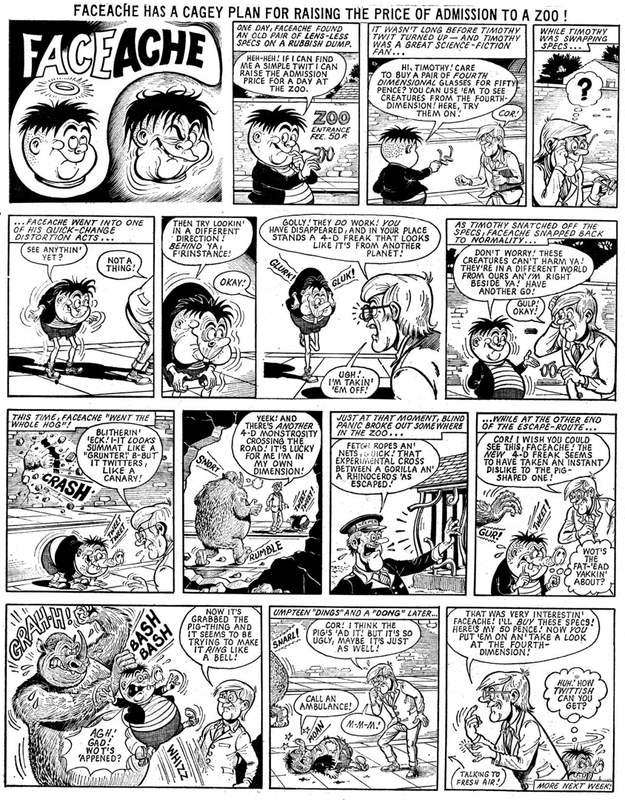 I think they should have gotten rid of one page of text story and spread this comic strip out over at least three pages. And finally, the back cover is given to The Ghost of the Haunted Pre-Fab, although really that should be ghosts - as there are three of them. For those of you that don't know pre-fabs were houses built with large panel pieces (for example - an entire wall would be one panel) for soldiers returning from the war (another indicator of the comic's date). They were only meant to be temporary with an expected life expectancy of 10 years but many of them are still standing today. 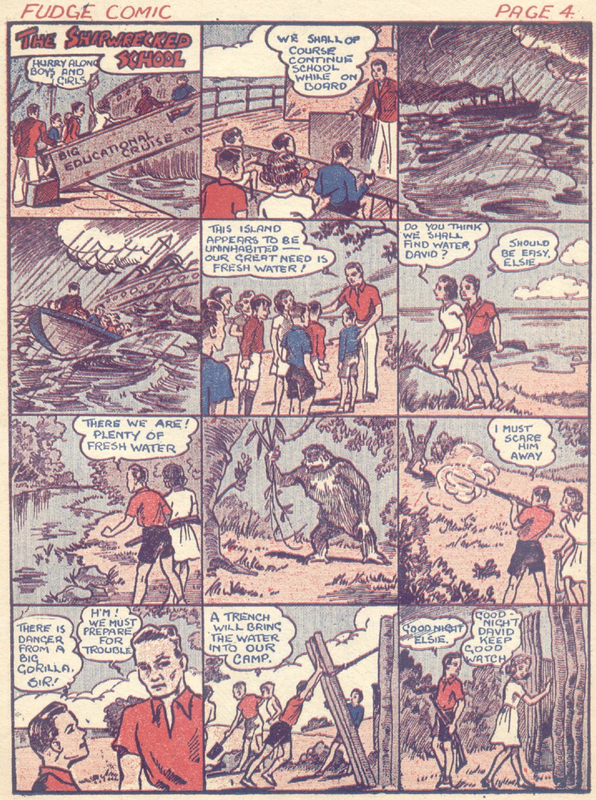 Anyway, this strip is certainly better than The Shipwrecked School on the centre spread. I've been looking at a few summer specials over the past months so today I thought I'd do something slightly different and look at the advertisements for various specials. 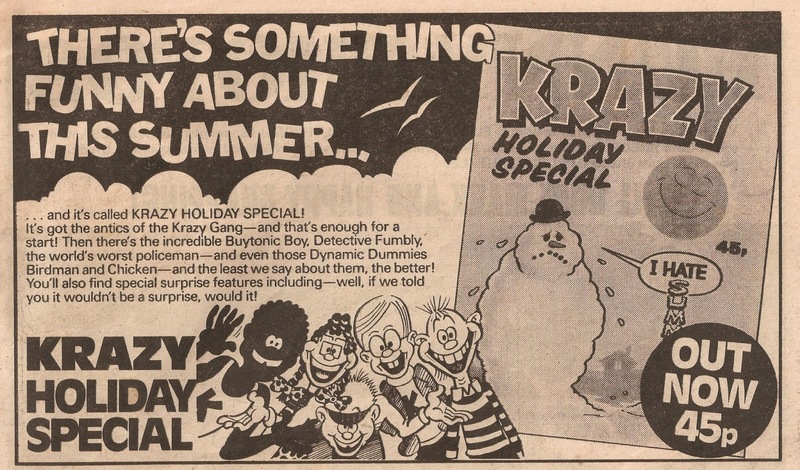 We start off by heading back to 1980 - the 3rd of May to be precise, and take a look inside that week's issue of Jackpot, which contained this nice ad for that year's Krazy Summer Special. 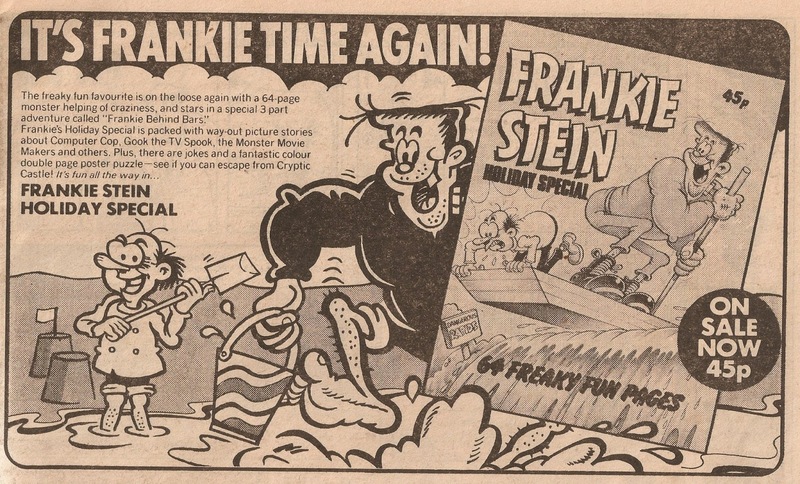 ...with the ad for the penultimate Frankie Stein special appearing later in the comic. Moving away from Jackpot let's head back to 1968. 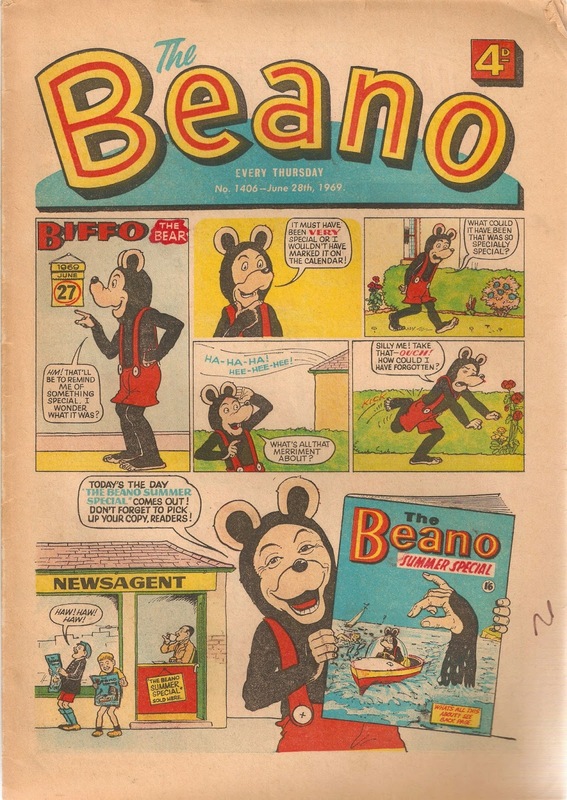 On this cover of this July edition of The Beano the cover star, Biffo the Bear, rushes around trying to get that year's special. There was a similar cover a year later. 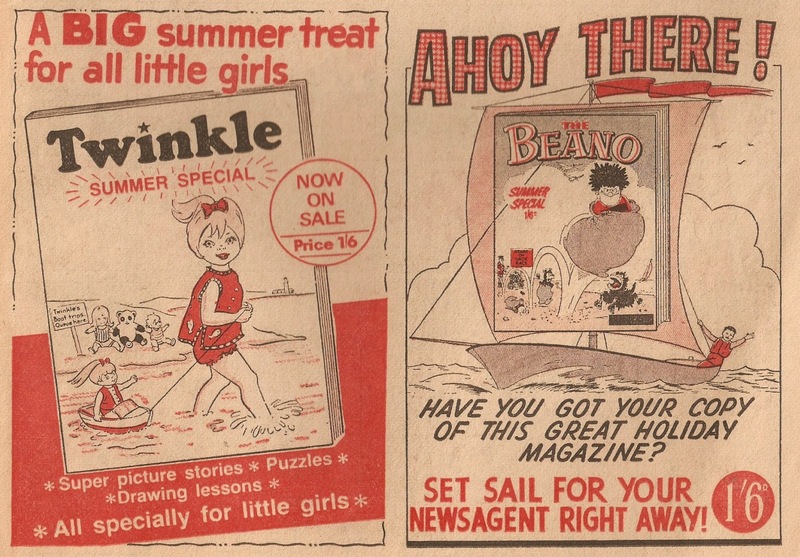 And here's a half-page ad for the 1970 Twinkle and Beano specials. Come forwards to the Whizzer and Chips of '76 and here's an ad for the one and only Vulcan special. 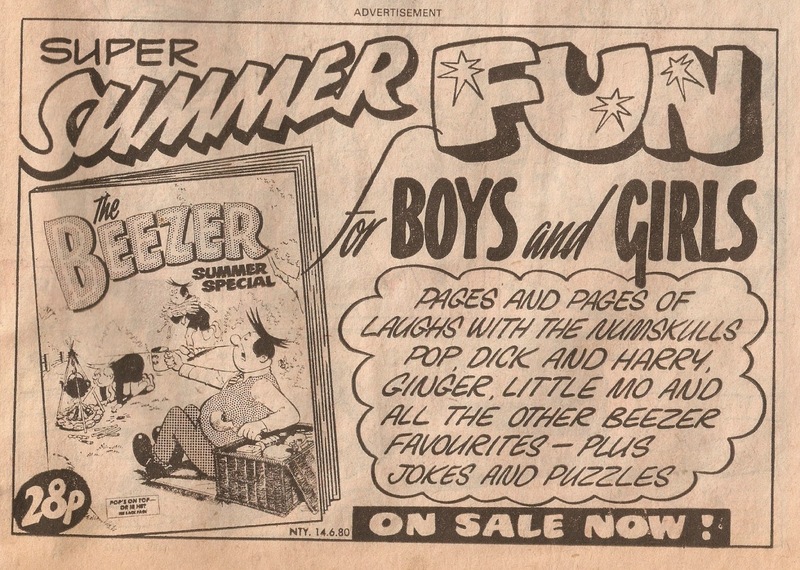 Back (or should that be forwards) to 1980 and we find an ad for that year's Beezer special in the pages of Nutty. 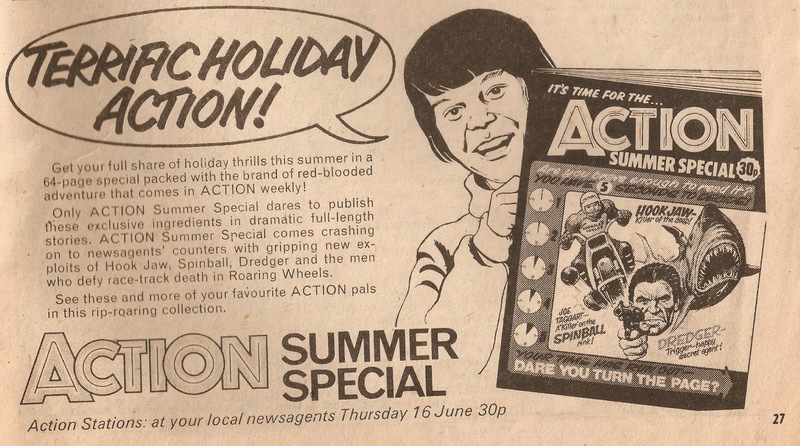 And finally, I'll wrap up this post with a half-page ad for the second Action special, found in Krazy comic dated 2nd July 1977. 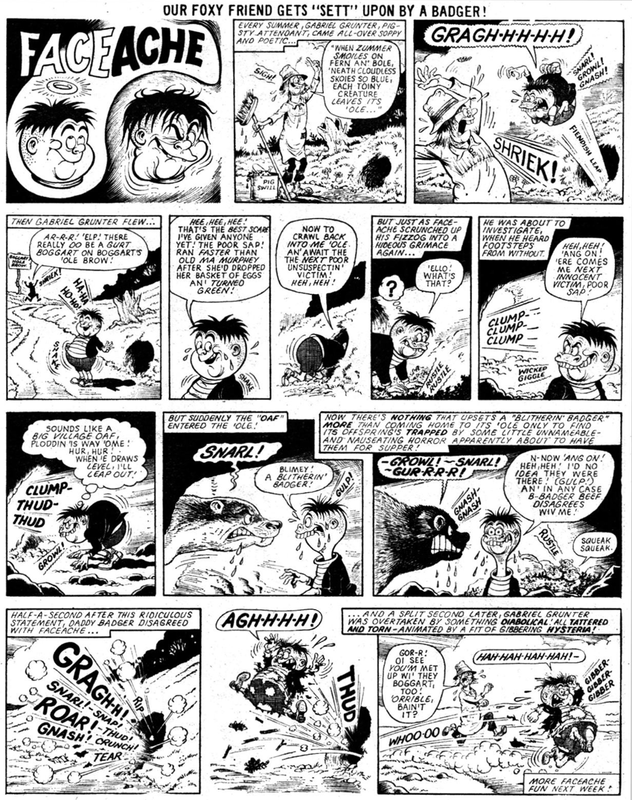 Malcolm Morrison was a Scottish scriptwriter for Fleetway, working mostly, as far as I'm aware, on the humour comics. Amongst others he wrote Joker, Shiner and Junior Rotter - so he clearly had a way with words, as all were hugely popular characters with long runs. It's now time for the third and final part of Faceache's strips in Jet. 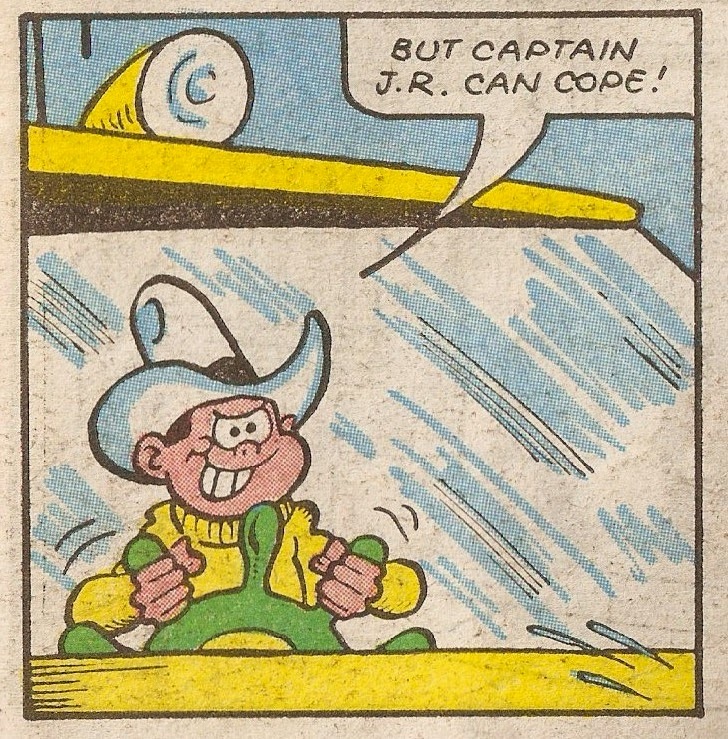 This includes the remaining seven episodes from the weekly Jet comics and the strip from the one and only Jet annual - a two-pager that is Faceache's only Jet strip with any colour. 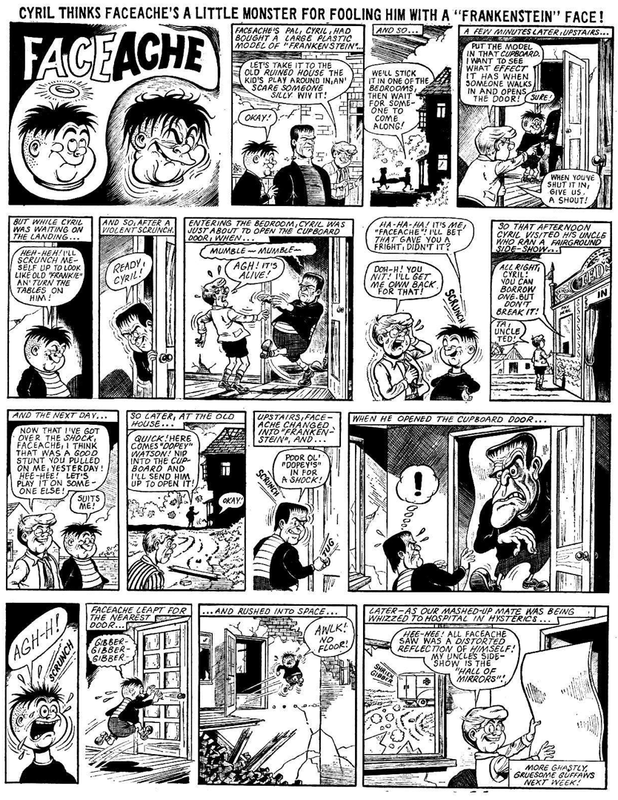 As ever the excellent Ken Reid illustrates them. 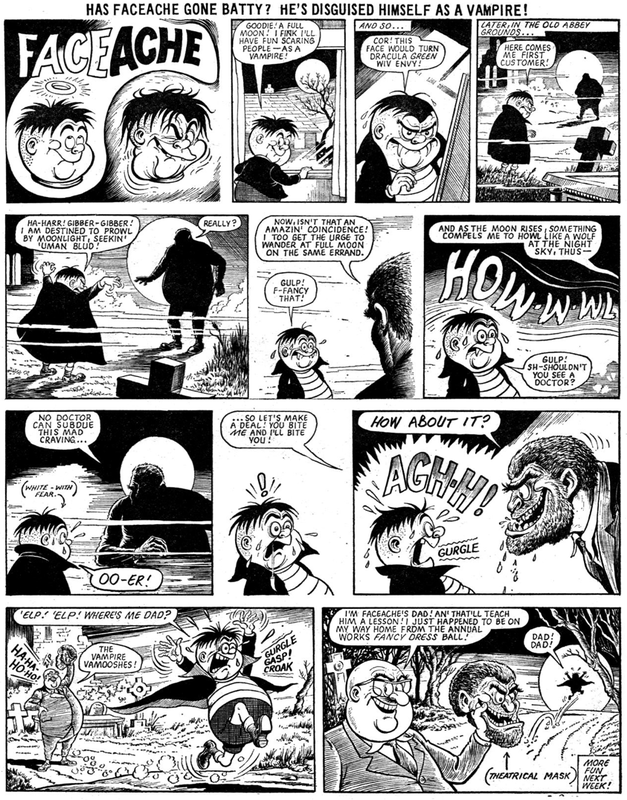 Number 18 is my favourite here, although number 21 is also good as it features a Frankenstein model and a character which looks a bit like Mickey from the Frankie Stein strip - a reference by Ken, perhaps? 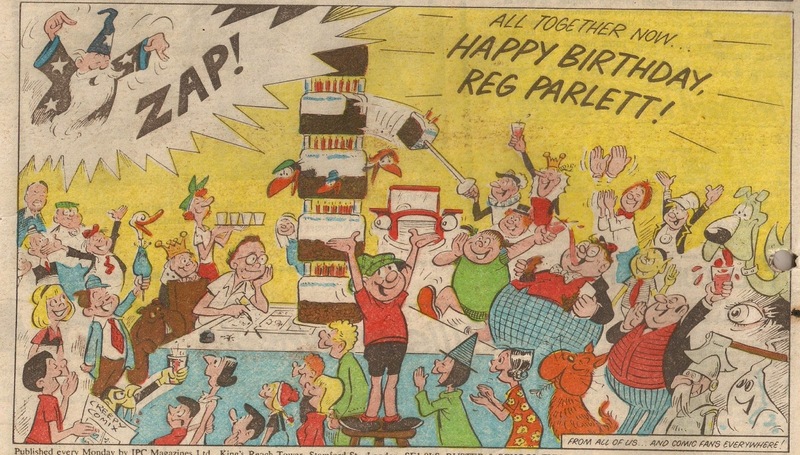 Today is Reg Parlett's would-be 110th birthday. 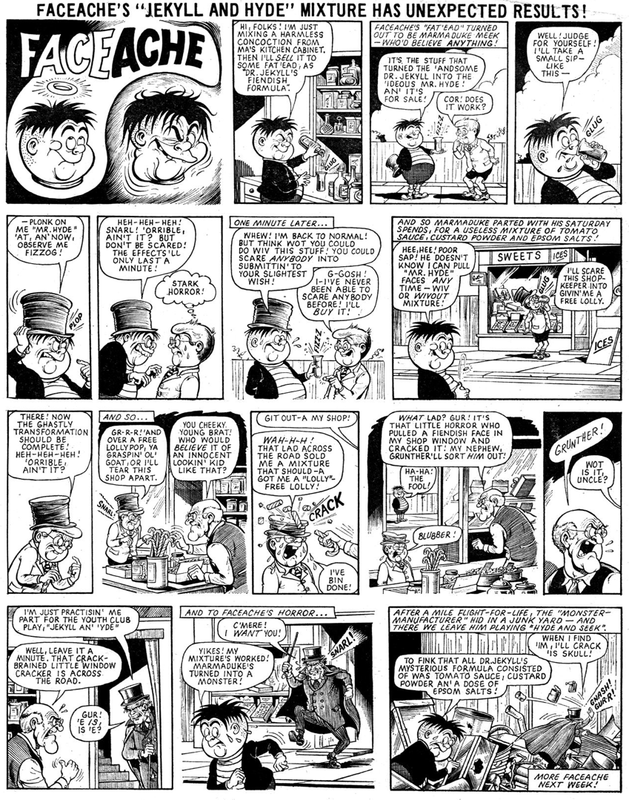 Reg is one of the all time greats and has illustrated thousands of pages in a career that lasted for over 60 years. 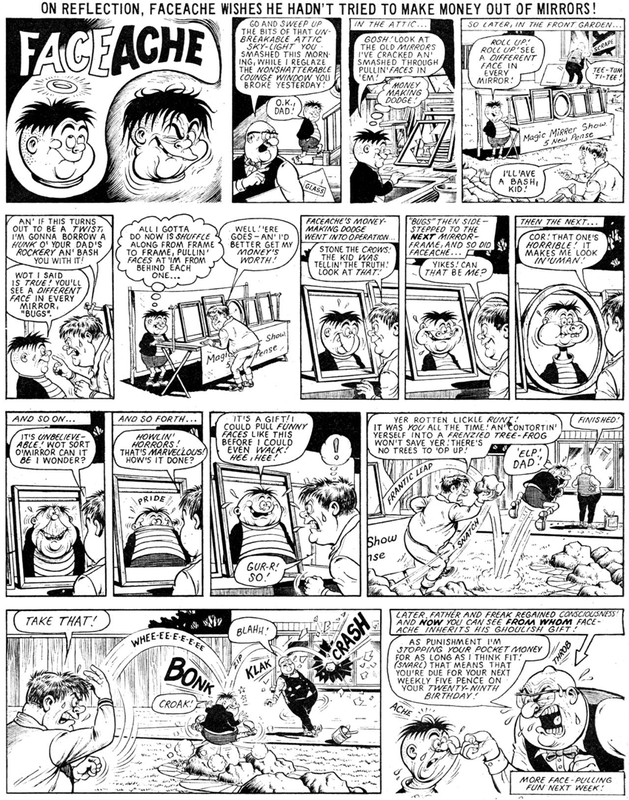 I suspect he has drawn more pages than any other British comic artist ever. 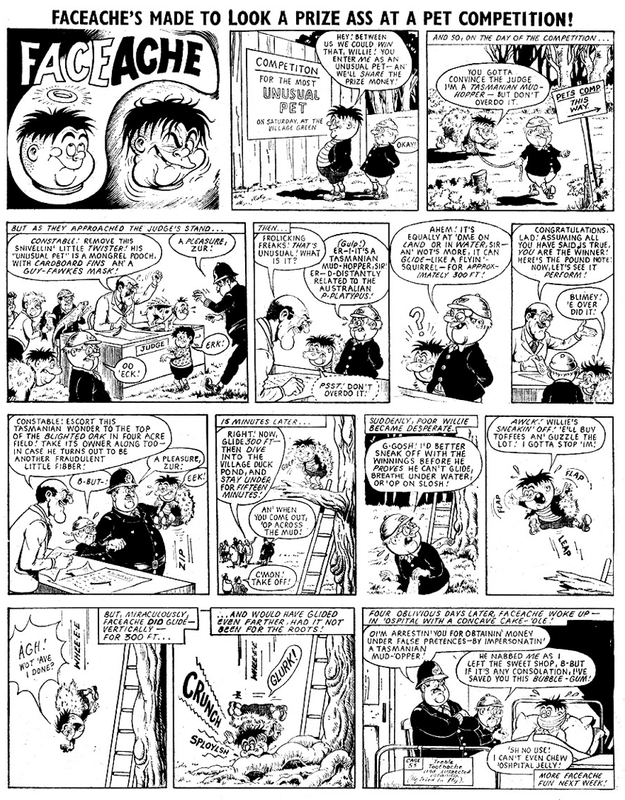 His first artwork appeared in Merry and Bright when he was 19 and he would go on to draw many well-loved and long running characters such as Billy Bunter, Buster and Ivor Lott and Tony Broke. Sadly, Reg passed away on 18th November 1991 but I'm sure the love and appreciation for his artistic talent will live on for a long time yet. 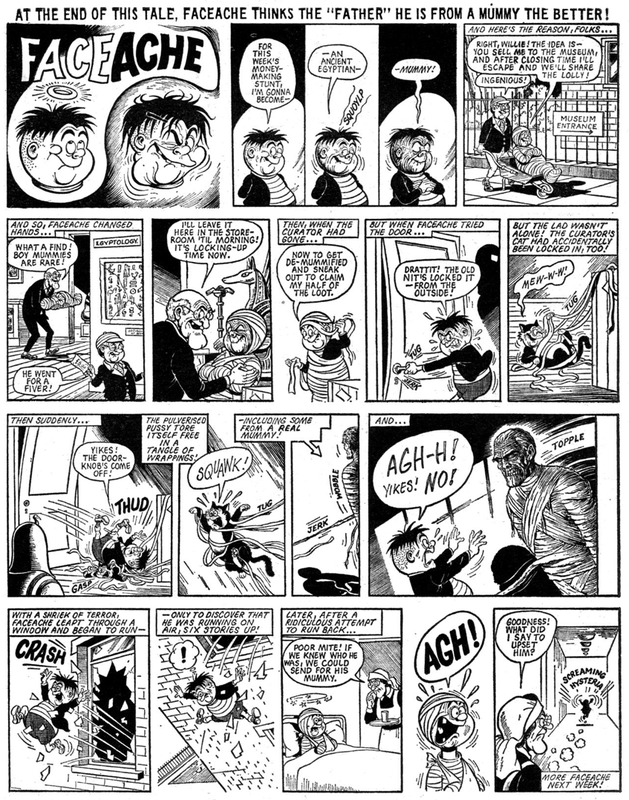 It's time for the second installment of all of Faceache's strips in Jet, as illustrated by Ken Reid. Here we also meet Dad for the first time, who appeared in the thirteenth episode - a coincidence, do you think? 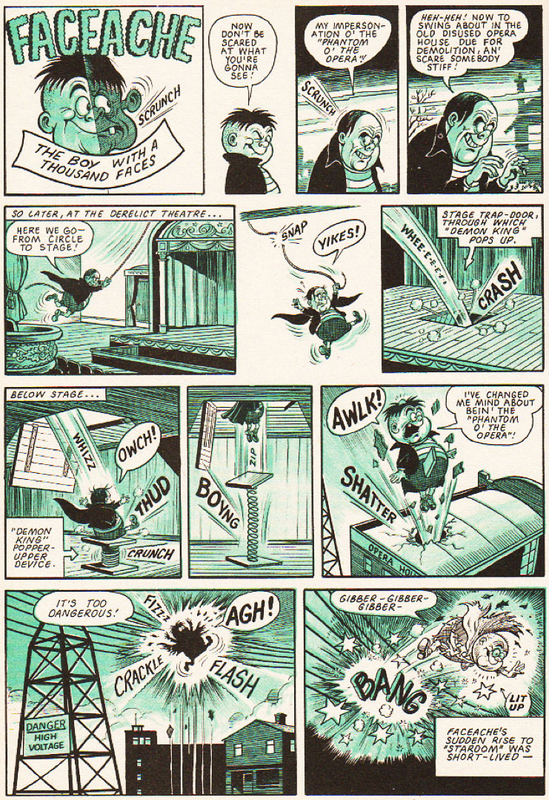 Come back soon for the third and final part, which includes the remainder of Faceache's weekly Jet appearances and his appearance in the one-off Jet annual from 1973.